Sift together flour, sugar, baking powder, and salt. Set aside. In a small bowl, beat egg whites until stiff; set aside. In a medium bowl, beat egg yolks well. Stir in milk. Add sifted dry ingredients to egg yolks and mix until moistened (be careful not to over mix). Add vegetable oil. Fold in egg whites. Pour cinnamon in mixture. Stir. Add apples. Blend lightly into mixture. 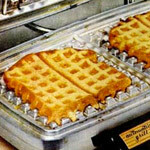 Bake in preheated waffle maker for at least 4 to 5 minutes, until crisp and brown. You can also try adding different fruits and spices instead of apple and cinnamon. For toppings, maple syrup is great, as is apple sauce and a dollop of whipping cream. Mr Breakfast would like to thank Sarah_12 for this recipe. 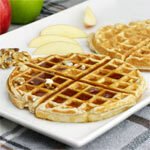 What do you think of Apple Cinnamon Waffles? View all 61 comments for this recipe. Delicious! Crisp and full of cinnamon flavor. Great with fresh berries! I added some raisins and it put it over the top! Delicious! I love these waffles! I make a huge batch of these and freeze them to have on hand for the kiddos since they love their breakfasts hot. Cereal doesn't do well with these kids. As a kid, I loved the Eggos Apple Cinnamon Waffles but now I can't find them anymore so I figured I would make them on my own and this worked perfect. They are better than Eggos. LOVE THEM! My batter came out very heavy and stiff, checked my measurements and they were spot on. Needed more milk I would say. Flavor was pretty good, maybe a few drops of apple flavoring to push it over the top. Don't over-mix, but add the oil after the dry ingredients have been mixed with the egg yolk mix? Bad idea. What a mess. So tasty. I served mine with an apple cider syrup. Would love to email this to myself. How? Note From Mr Breakfast: You can use the "share" button above the recipe title and it will give you the option to email the recipe. Thanks for the question. Omg... I just made this and my husband and son loved it as well as I. The only thing is that I didn't make a double batch. I got 4 waffle. I could have gotten 5 waffles out of it but I second guessed. 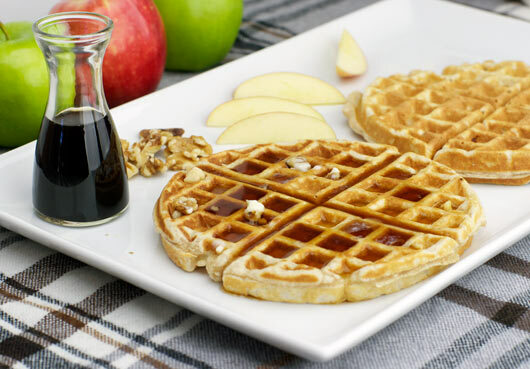 Add apple slices separately, one to each section of the waffles. Or dice the apples so they spread out more evenly when you pour the batter into the iron. 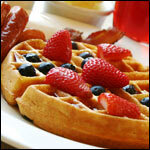 Our favorite new, go-to waffles. Thanks! They are the very best! Awesome, Easy, Delicious Recipe. Came out perfect!! 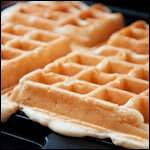 I love to make this waffle recipe. It's easy and quick. Thanks! What would be the best kind of apples to use on this recipe? Good stuff! 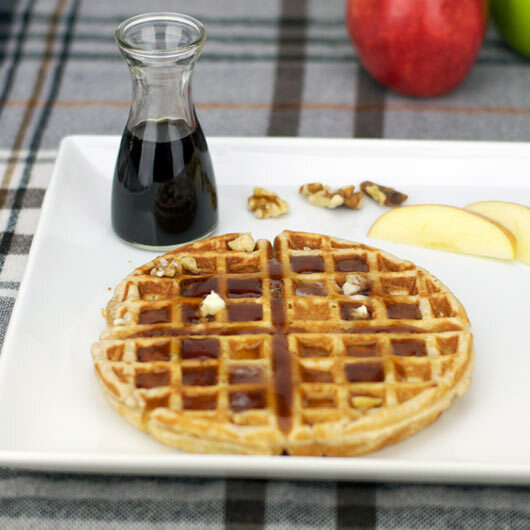 I especially like the edges where bits of apple touch the waffle plates and get a little caramelized. We just used butter and maple syrup for the topping. These came out perfect, with no substitutions. Wish I'd have read the comments and added a bit of vanilla, though. 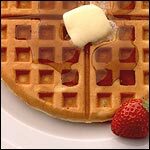 I don't make waffles often, but I'll keep this recipe around. 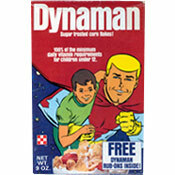 Please type the name of the cereal below.